This fantastic bouquet of exotic Dendrobium Orchids and Tropical Leaves encompass the mysteries of the tropics. 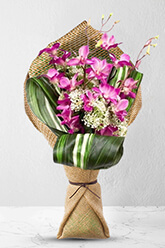 This stunning, lush bouquet will work beautifully in a corporate environment or as a point of interest at home. Pictured vase not included however; for a lasting impression, we recommend a Premium Vase to complement Mystery. good value, fast service and excellent choice! good value, great choice , fast and excellent service! Love that you contact me for my yearly events and make it super easy to order flowers to Japan. Thanks. I ordered these flowers for my daughter in law's birthday, its very hard to choice something on line but she sent me a photo and they did look lovely. I needed to send flowers to my sister for her birthday in Hong Kong by next day, excellent choices, easy to use on-line service, flowers were delivered on time and they were lovely. Easy ordering process, speedy service, good value and great at keeping me informed of the delivery taking place! I would certainly use ZFlowers again and recommend them wholeheartedly.